Today NVIDIA launch their Shield TV box and GeForce NOW subscription service, delivering 4K video streaming and a Netflix-esque games library to your TV. It’s an increasingly busy market, with tech titans Apple and Amazon both offering something similar. NVIDIA reckon they’ve got Apple TV pipped – but then they would say that, wouldn’t they? Looking at it from a gamer’s perspective, though, NVIDIA’s model may well make the most sense. The Shield Android TV box retails at £149.99 for the 16GB mode plus a wireless controller or £219.99 for a heftier 500GB model, while GeForce NOW priced at £7.49/month. It’s free for the first three months when you buy the Shield hardware, though. That subscription fee buys you instant access to a library of over 50 free games, including GRID Autosport, The Vanishing of Ethan Carter, Telltale’s Walking Dead Season 1 and more. It’s a respectable, if not stellar, roster. There are also several titles available to ‘Buy & Play Instantly,’ giving you digital ownership of a given game that you can subsequently stream as and when you like. The big-hitter here is The Witcher 3: Wild Hunt, available for £49.99, although Mad Max is also on the way, priced identically. So far there are just twelve titles in this section. Realistically, that combined offering probably isn’t enough to get you to subscribe right away. But GeForce now does have serious potential – delivering a stated 1080p, 60FPS streamed playback with latency of around 120ms. For reference, PC monitors operate with anywhere between 10-68ms input lag. Playing a game via GeForce now doesn’t feel exactly like playing it on native hardware… but it’s impressively close. And this is day one of its public launch. Then there’s 4K streaming – the Shield is currently the only Smart TV device that supports this, and Netflix is already gearing up with 4K material including Marco Polo, Marvel’s Daredevil, and Narcos. That makes for quite the one-two punch: a jab of acceptable game streaming service, a follow-up hook up ultra-HD binge-watching. Apple might have the superior brand power (and know better than to install a luminous green LED in their TV box), but they don’t cover the bases for gamers and 4K TV owners like NVIDIA do. 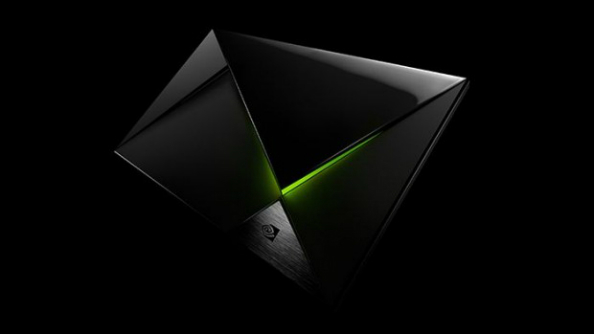 That said, it’s unclear who NVIDIA are really going after with the Shield and GeForce NOW. They know PC gamers care more about outright fidelity and tweakable graphics options than playing on a sofa, and presumably they want to go on selling lots and lots of enthusiast-level graphics cards, so their new product launch can’t be aimed squarely at them. At the same time, it’s unlikely that anyone thus far sold on Apple TV would be likely to perform a u-turn based on the chance to stream GRID Autosport in their lounge. Marketing aside, the raw components are there for Shield and GeForce NOW to have a real impact on the way games and streaming TV services are consumed. We’ve requested a review sample and will be posting our hands-on impressions soon.